Well, half of her anyway. The two main sections of cosmetically-restored N&W 1134 have left Roanoke, bound for Portsmouth for final re-assembly and display at the Railroad Museum of Virginia. Although the frame and running gear are making the journey by rail on a flatcar, the boiler was loaded onto a lowboy trailer for delivery by road. The Roanoke Times ran an article today about the restoration of N&W 1134, which is nearing completion. The restored 16,000-gallon tender is already at the display site in Portsmouth, VA, and the locomotive is expected to be joining it in the coming weeks. The Western Virginia Railroad Preservation Society raised almost $4,000 in its Lost Engines Appeal. Now that the "Lost Engines" are saved and the long process of restoration has begun, TWVRPS has chosen to donate this money to the Roanoke Chapter, NRHS to support its efforts to restore N&W 1118 and Chesapeake Western 663, and the Virginia Musem of Transportation's Chesapeake Western 662. Wizzy Strom has posted some new pictures of the move of the Chesapeake Western diesels and restoration work on 1134 being performed at the Roanoke Chapter, NRHS. The Virginia Museum of Transportation's blog has been updated with a new post about the Lost Engine moves, with photos of the 1151 move and video of the Chesapeake Western diesels being towed into the 9th Street yard of the Roanoke Chapter, NRHS for restoration. Twelve years, nearly to the day, since the Lost Engines of Roanoke website was launched, the scrapyard siding is finally empty. The two Norfolk & Western tenders were removed from the yard on Thursday, August 27, followed by the two Chesapeake Western diesels on Friday. This week, the remaining loose parts will be collected from the ground, the rails will be removed, and the South Jefferson Street yard of the Virginia Scrap Iron & Metal Company will be just a memory. The "Lost Engines of Roanoke" are lost engines no more, now begins the long process of restoration. Of the thousands of steam locomotives that went into the nation's scrapyards at the end of the steam era, Norfolk & Western 1118 became the very last one left awaiting her fate, after the departure of 1134 on Monday. Thankfully, hers is a much happier fate than so many that went before her, and her turn to leave the yard came on Tuesday, after 59 years in waiting. Both locomotives are now at the 9th Street facility of the Roanoke Chapter, NRHS, which is the new home of 1118, and where 1134 will receive cosmetic restoration work before going to Portsmouth for display. The Virginia Museum of Transportation has announced that M2c no. 1151 will be moving from the scrapyard today. M2 no. 1134 will begin her journey on Monday, and will receive cosmetic restoration work before being delivered to her new home in Portsmouth, Virginia in the spring. The locomotive boilers will be separated from the frames for the move. The Roanoke Chapter of the NRHS has concluded a deal to trade their E.J. Lavino 0-6-0T no. 34 to Will Harris in exchange for M2 no. 1118, which will now remain in Roanoke at the NRHS chapter's 9th Street facility. I have posted some new photos of Simons Wrecking Co. no. 2 undergoing cosmetic restoration in her new home in Essex, Connecticut, and American Viscose Co. no. 6 in steam at the Owosso, Michigan Trainfest. The Virginia Museum of Transportation has announced its plan to remove the remaining equipment from the Virginia Scrap Iron & Metal Yard, in cooperation with the Railroad Museum of Virginia and Mr. Will Harris of North Fork Lumber. Roanoke-built M2c no. 1151 will go to the VMT, along with one of the N&W tenders and one of the Chesapeake Western diesels. M2 no. 1134 and the other tender will go to the Railroad Museum of Virginia for display in Portsmouth, VA, and 1118 will join Will Harris' collection in Goshen, VA, along with the flatcar. The fate of the second Chesapeake Western diesel locomotive is still to be determined, but it may be parted out and scrapped. On behalf of the Lost Engines of Roanoke Website, I have pledged the symbolic sum of $1118 to the Western Virginia Railroad Preservation Society's fundraising campaign. Please join me in support of this effort to save the remaining locomotives in the Roanoke scrapyard. The Western Virginia Railroad Preservation Society announces a fundraising campaign to rescue the remaining historic railroad equipment in the Roanoke scrapyard. W2 class 2-8-0 no. 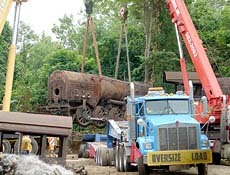 917 (temporarily an 0-8-0 with parts removed for weight and height clearance) was loaded onto a truck on July 8, 2008 for delivery to her new home in Bellville, Ohio. Click here for more photos and coverage of the move. To the casual observer, the locomotives and other equipment in the Virginia Scrap Iron & Metal yard still look much the same as they have for decades. Behind the scenes, however, big changes have taken place in the last few years. In October of 2003, VSI&M owner Sam Golden passed away. While his inflated sense of the equipment’s monetary value and unwillingness to sell individual pieces may have kept the equipment in the yard and out of the hands of would-be rescuers, it was also Sam Golden who kept these historic treasures intact all these years rather than scrap them, and for that we all owe the man a debt of gratitude. Also in 2003, a new organization was formed, The Western Virginia Railroad Preservation Society, initially with the goal of preserving the "Lost Engines" and rolling stock in the VSI&M yard, and the broader mission to preserve and interpret the history of railroading in Western Virginia. Finally, in August of 2004, the executors of Sam Golden’s estate (he had left no heirs) made the decision to donate the four steam locomotives, two Baldwin diesels, two tenders, four hoppers, and the flatcar to the Virginia Museum of Transportation in Roanoke. The VMT is currently making arrangements to move the equipment out of the yard, and the physical work of preparing for the move is expected to begin in the near future. It is likely that the VMT will keep the Roanoke-built M2c 1151 and the sole surviving W2 917, and possibly one of the Chesapeake Western diesels and one of the hoppers, but the future of the rest of the equipment remains uncertain. Watch the Virginia Museum of Transportation website for updates. I will also post updates here as they become available. After the donation of the "Lost Engines" to the VMT, The Western Virginia Railroad Preservation Society remains committed to its broader mission, and is pursuing other projects around the region. The group is currently working to set up a restoration facility for their own use as well as for other organizations in the area, and has recently been given a set of steam-era machine tools by the Railroad Museum of Pennsylvania. These tools, consisting of a large steam hammer, a 24-inch lathe, a forge, a 60-inch vertical milling machine, and a radial arm drill press, must be moved from the RRMoPA by the summer of 2006. Much of this equipment is sitting on a flatcar in the museum’s yard, and the car, a 1906-vintage Pennsylvania FM class fishbelly flat that is historic in its own right, is scheduled to go into the shop for restoration this year. The Society must raise approximately $3500 by April to move the tools to their site in Virginia. To support their efforts, please click here.